If you don’t find me complaining about time not being enough, then you know something is wrong. This post was to be a Masti Monday, then I thought maybe it will make it to be a Tasty Tuesday. Finally it is going to be Wondrous Wednesday! Wondering what’s with these weekday rhyme? Well a local sweet shop happen to be posting their ads in the local newspaper since Monday, their special dish for each day. I was very eager to check out what it was going to be for Wednesday and was disappointed that they didn’t do any ad today. Konda wanted to follow her weekly menu from this week on. Though I was thinking I should put it up since Sunday, never came around doing it. So decided that tagging each day was going to be fun. 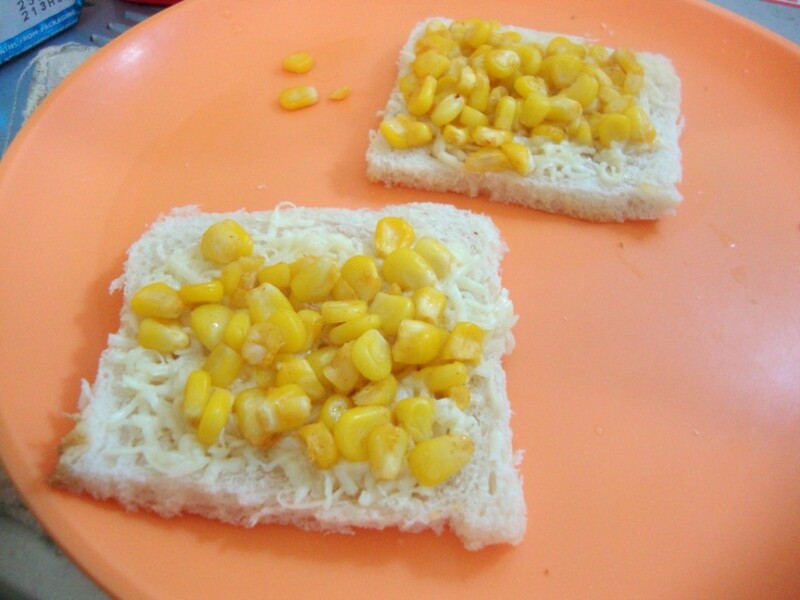 She had this delicious Corn open Sandwich and decided it made a Masti Monday Breakfast for her. I get to talk about it today. The corn was made just like the Masala Sweet Corn Butter Chat, just I sprinkled little bit of pepper because of the cheese being added. I was also thinking I should some dried herb next time. For the past couple of weeks it’s been a corn feast for Konda. She said I should get her these sweet corn every week from our weekly vegetable shopping. Days are tight! With much thinking, I decided I would skip the Blogging Marathon this month, knowing that the last week will be hectic for me. But then so will be October, but will surely have it then. I miss my Blogging Marathoners! With so much to write always and so little time, I wish I can always remember these passing days. Just another three months and this wonderful 2011 will be off..
Seasoning – any dried herb. Wash the corns, add just enough water to the corn. Microwave for 7 – 10 mins depending on how much corn you are cooking. Drain the water, add butter, all the masala and micro for 1 -2 mins. Trim the bread, add grated cheese over the bread, top it with the masala corn, then again top it with some more grated cheese. Note: Just caution the kid of the hot, as it’s straight from the oven.